Potholes were originally named due to their being the same size and shape as pots. Potholes are round bowl-shaped holes in the ground which occur due to the loosening of the asphalt due to the heavy use of it by traffic as well as the wearing down of the roads due to the elements. Potholes form when a certain section of the road has become worn out which tends to expose the concrete underneath. A pothole starts off very small, and if not contained, it can become quite big rapidly as, growing to several feet wide with the help of water. 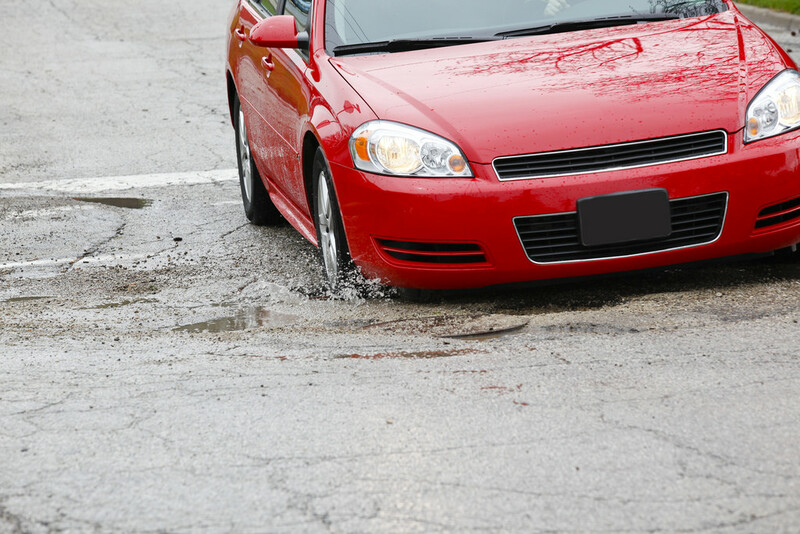 Potholes damage your car’s suspension and shock absorbers which can become quite expensive over time as some potholes can make an impact similar to that of a 35-mph car accident, but only if they are deep enough. A bumpy road can be annoying to you as a driver, a road filled with potholes is downright damaging to your car and risky for your life. Accidents are increasing day by day due to worn down roads filled with potholes which need repair. Potholes don’t only cause car accidents but also cause fatal motorcycle and truck accidents as well as increasing the damage to the road. Do not tailgate anyone. Keep a safe distance behind the vehicle ahead of you so that you have enough time to see the potholes ahead of you as well as being able to avoid the flying stones and debris that are likely to be kicked up. This will also allow you to brake faster. Keep your vision high with occasional glances to the road surface for any potholes. Focus on your driving as being distracted will make you miss the potholes and how to avoid them. Keep both hands on the steering wheel at the 9 and 3’o clock position. This will give you the best control over your car and help you steer around the potholes. Don’t swerve violently to avoid potholes. Any manoeuvres should be done with smooth steering movements. Jerking violently can result in a loss of control leading to damage or injury. Stay aware of all oncoming traffic and don’t swerve into oncoming traffic to avoid a pothole. Most potholes are formed along the seams of the pavement and where the truck and bus tyres wear down the asphalt, and allow the water to enter the road base. Avoid this by keeping your tyres off the well-worn areas of the road. Slow down on rough roads to get a better chance of avoiding potholes. Higher speeds tend to reduce your reaction time and control. Slow down when driving through a pothole but better get off the brakes just before you encounter the pothole. This will reduce the load on your car suspension as well as the impact force. Be careful with water-filled potholes as you are not able to see the real depth of the pothole, avoid them if possible. All of you must have experienced the misfortune of hitting a pothole. You would agree that it is quite damaging and quite an expensive affair. Potholes tend to wear out your tyres and increase poor fuel economy, and in extreme cases leading to loss of control. Potholes are a hindrance in all of our lives and on all our roads. Not fixing your pothole ridden roads/pavements on time is bound to ruin them entirely over time. Contact us at Jackson Asphalt to cut your losses and restore your road to its former glory.